Guide to Job Hunting: Phone interviews sorted! 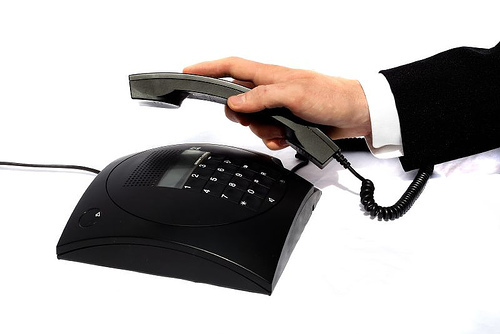 In some cases, telephone interviews are a way for employers to “pre-screen” possible job candidates before they are granted an in-person interview. In other cases, employers will conduct the full interview over the phone. Whether you are required to go through a pre-screening or have already been given the interview, you must be even more prepared than you would be for an in-person interview. Below are some telephone interview tips to keep in mind so your next phone interview is a success. You don’t want to risk having problems with cell phone service. It is irritating for employers to conduct interviews if the call breaks up frequently or is dropped completely. If you don’t have a land line at home, just make sure you are in an area with as much cell phone service as possible. Do what you can so the process runs as smooth as possible. 2. Keep your materials handy. In fact, lay everything out in front of you. This includes your CV, notes about your career objective (even if it isn’t included in your original cover letter it’s a good idea to have this out depending on the questions he will ask you), a pen and pad of paper for note-taking and anything else you think may be helpful during your interview. 3. Steer clear of distractions. When you speak to people face-to-face, you are able to understand what they are saying more clearly because you can see their mouth move. So in a way, you are reading their lips! Neither you nor your potential employer will be able to do this over the phone of course, so speak clearly and a little bit more slowly than you would if you were talking to this person in person. If you can’t hear him, politely asking him to repeat himself or speak up. 5. Remember – you can’t be seen. That means that anything you say cannot be interpreted by your body language. Beware of jokes or sarcastic remarks that would have been harmless had he seen your facial expression. Maintain your professionalism; stay on target with the interview topics and focus on the key information about you that will get you hired. 6. No eating, drinking or chewing gum! This is self-explanatory. But, we humans are creatures of habit and might pop a potato chip in our mouths at just the wrong moment. You should eat beforehand to get your brain going so you can focus. 7. Prepare questions ahead of time. Just like in a personal interview, prepare a few questions to ask your potential employer at the end of yourphone interview. Some examples are: “What does a typical day look like for an employee with this job?” “What are some skills I would need to develop in order to excel in the position I’m applying for?” “What software/equipment would I be using?” Remember – do not ask about salary or benefits until the employer has brought it up. You’ll most likely be given the names or at least the job titles of the people you are due to meet. Look them up on the company’s website and on social networking sites. Try to figure out what makes them tick. Which are the most important functions in the company? For example is it a sales-led or an innovation-led company? Prepare examples from your work history which demonstrate skills and attributes which will be deemed important to each of the people around the table. It can be tempting to focus on the person who greeted you at reception and direct your comments to them or to only focus on the most senior person at the table, but this could be a mistake. Make sure you make eye contact with everyone from the moment you enter the room. If you don’t it could be perceived that you’re avoiding them. There may be some people who sit silently observing and making notes while others dominate the conversation. Everyone who’s at the interview is there for a reason and needs to be included when you address the panel. Be mindful that the note-taker could be the CEO’s PA and will have a valid view on your suitability for the role you’re interviewing for. Is it possible to please everyone? Yes, if you know how to seed the conversation with the right information. Have you ever been to a movie with friend and found afterwards you both liked different parts of it or had forgotten about things your friend remembered vividly? This is because just like everyone else you filter information out and focus on what appeals to you. You can safely bet that everyone around the table is listening out for the things that are relevant to them and will ignore much of the rest of what you say. They don’t do it on purpose, it’s just that it’s impossible for them to mental record every single word coming out of your mouth. In a panel interview situation, there’s a specialist in most business areas sitting in front of you. This is not the time to bluff your way through your answers. They will compare notes afterwards and you can be sure the specialist spotted your bluffing a mile off and will tell everyone else. If you don’t know the answer to a question and can’t call the information to mind on the spot, explain how you would find out. With a panel interview you’re still dealing with people. They all have a vested interest in finding the right person for the role. With the right preparation, you can demonstrate to all of them that you’re the person for the job.